Iimura added that those responsible for the thefts, committed over a series of nights last month, were likely professionals, as they had identified the “most valuable trees” from the couple’s roughly 5,000 hectare park, which has around 3,000 bonsai trees. Fuyumi Iimura’s husband, Seiji Iimura, is a fifth-generation bonsai master whose family practice dates back to the Edo period (1603-1868). Originating from the Chinese ancient art of “penjing,” or miniature landscaping, bonsai was introduced to Japan in the 6th century by a group of Japanese Zen Buddhism students returning from their overseas travels. They dubbed it “bonsai”, which literally means “planted in a container,” and — at its most elementary level — the art is simply growing a wild tree inside a small vessel. Iimura said that the 400-year-old stolen tree had been taken from a mountain centuries ago. Through an in-depth knowledge of plant physiology, Iimura’s family had gradually shrunk the tree to its miniature form. It measured one meter (3.2 feet) tall and around 70 centimeters (2.3 feet) wide when stolen. “It’s not something that can be done overnight,” said Iimura. “It’s hard to regain ownership of your tree once it’s switched hands,” said Iimura. 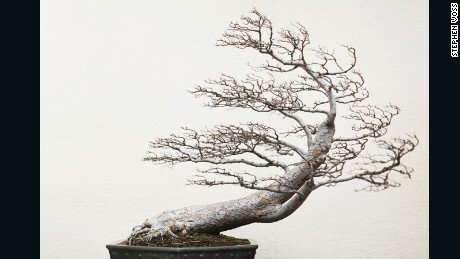 “I want whoever took the bonsais to make sure they are watered. The shimpaku lived for 400 years. It needs care and can’t survive a week without water,” said Iimura.